| 1—Research of Hannah McNeill McMillan and Mary Lou Stack Huske of Red Springs, NC and the Bible record of Barbara P. McNeill, granddaughter of James McNeill, dated 1853. Transcribed from the original by Mabel McNeill Smith Lovin and is page 1 of Part 4 of her McNeill history. Bible now in possession of the family of Mary Lou Huske (dec'd) | 2—1828 will of Danold McNeill in Cumberland County, NC; | 3—1801 will of James McNeill in Cumberland County, NC; | 4—Letter dated 1842, Kemper Co., Miss. from Archibald C. Currie | 5—Photo of Elizabeth McNeill McNeill's gravestone in East Carroll Parish, LA, courtesy of Jimmy Coleman, Epps, LA who told me the grave had been moved to make way for a highway | 6—Philippi Cemetery inscriptions | 7—Deeds for Daniel and his father James McNeill for their adjoining lands on the south edge of Rockfish Cr. 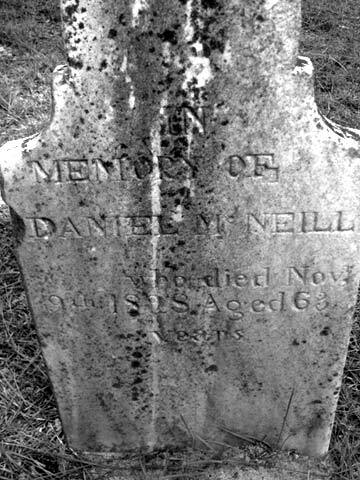 in Robeson Co., NC | 8—Photo of Daniel "Danold" McNeill's gravestone in Philippi Cemetery, Hoke, Co., NC | 9—Map of 18th-century plats of upper Robeson Co. drawn by Dan MacMillan, c.1980, NC Dept of Archives and History | 10—"Two McNeill Families Related by Marriage but not by Birth" by Cyrus McNeill, 1900 | 11—Mabel Lovin's history of her McNeill ancestors, Part 1, pgs. 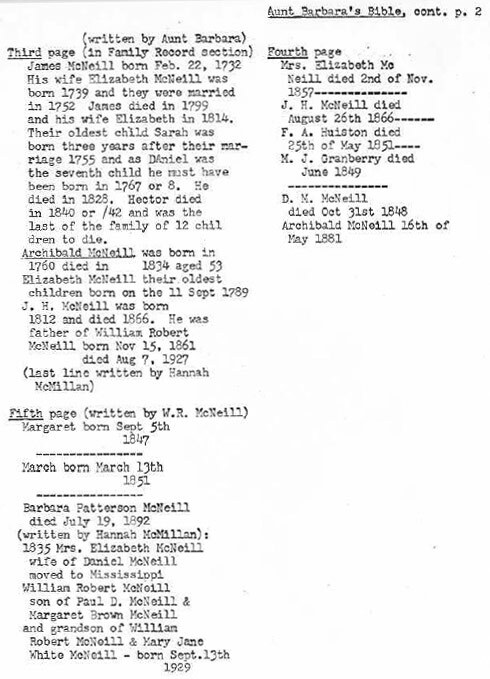 16-19 | 12—1881 will of Archibald McNeill, son of Danold McNeill, Robeson County, NC; | 13—Vanishing Ancestors, by Peggy Townsend | 14—North Carolina Digital Collections (online); cemetery trancriptions from 1940, page 3. 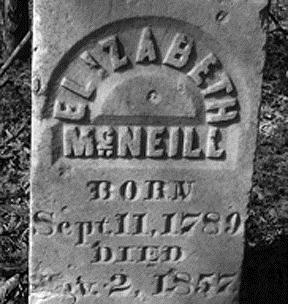 Notes on this Family : Mabel Lovin omitted the three daughters Daniel and Elizabeth had who are listed in his will of 1828. Lovin stated in her McNeill research that Danold and Elizabeth had a son named Benjamin Franklin McNeill but no such son can be found; however, a Benjamin F. McNeill is found in the 1900 census of Back Swamp in Robeson County, born in NC to parents who were born in NC, aged 44, with wife Hariet E. McNeill aged 44, and several children. Was Benjamin a son of "Black Hector" McNeill and Flora Ann McNeill? Benjamin F. McNeill was executor of Archibald McNeill's 1882 will, and Barbara P. McNeill lived with Archibald in the Moss Neck section of the county near Back Swamp. In Archibald's will he names his sister Barbara P. McNeill as "Barbary P. McOftes". In a diary by Barbary's cousin entitled The Uncompromising Diary of Sallie McNeill 1858-1867, Sallie states that Barbary had two sisters who are married; one sister, Isabella, married Archibald C. Currie, but the second sister's marriage has not been discovered. Sallie also states that Barbara had returned to Louisiana only to find their brother, James, married and "unatural", a scoundrel who would not help support her. She went on to say brother Archibald -- who was living for a time in Louisiana then -- took Barbary to NC to live with him at his own expense..